“Something came in the mail this morning.” My mom greeted me with the news as she handed me a letter. I could still remember that day, thirteen years ago. “It’s from Stanford University,” my dad who was waiting next to her said excitedly. My heart suddenly skipped a beat. The return label read Graduate Admissions Office. “I think this is it,” I told them. It was the letter I had been anxiously anticipating all summer. I slipped my finger through the envelope’s unsealed corner and swiftly slid my finger across to tear it open. I started to take the letter out but I hesitated. “I think I’m going to my room for a moment, if you don’t mind,” I told them. “Of course. Take your time,” my mom replied. I flicked the light switch on and laid the letter on the desk next to my tired, bulky computer. The heat of the afternoon sun lingered in my tiny room. I wiped the sweat off my temples with my handkerchief and turned on the electric fan. A million things raced through my mind as I sat on my bed and stared at the letter. I wasn’t worried about rejection. Life would go on sans Stanford education. It wouldn’t be the end of the world, I convinced myself. But I yearned for change. I was clearly unhappy despite a secure job, a supportive family, and a tight-knit circle of friends. I felt trapped in some profound emptiness and I was determined that moving to California and starting over would fill that void. I picked up the envelope, took a deep breath and read the letter. “It looks like I’m headed to Stanford in September,” I told my mom and dad as I stepped out of my room. “That’s fantastic, Jun!” I could tell that my mom was trying to hold back her tears. I showed them the letter and before long I teared up, too. To celebrate the wonderful news, my mom made sotanghon guisado [soh-tang-hon gee-sah-doh], fried mung bean noodles. 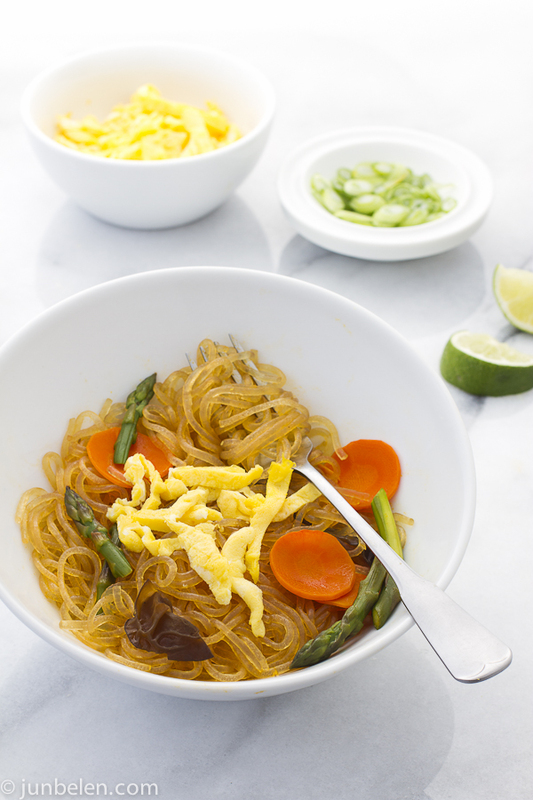 The glass noodles are boiled in chicken stock, flavored with soy sauce and fish sauce, stir fried with wood ear mushrooms and vegetables, whichever are in season, and topped with slivers of scrambled egg. For my family, noodles are synonymous with celebrations — birthdays, anniversaries, and holidays. My mom makes pancit to celebrate even the littlest victories and achievements. Last week, I made her sotanghon guisado because there was once again reason to celebrate. My humble blog was selected as a finalist for Best Regional Cuisine by Saveur Magazine. The news was truly unexpected and I am deeply honored and thankful, beyond words. The nomination is huge for Filipino food. I am thrilled that the flavors and ingredients I grew up with and have always loved are slowly getting noticed. Thank you so much, Saveur. And I am thankful, beyond words, to all of you dear friends, who keep coming back for the stories and recipes, and for the photographs, post after post. Our love for food and our love for the people we share that food with bind us together. This nomination is for all of you. 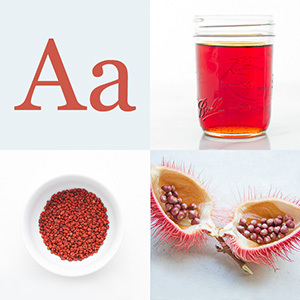 I invite you to visit Saveur.com to discover the impressive collection of food blogs from around the world. 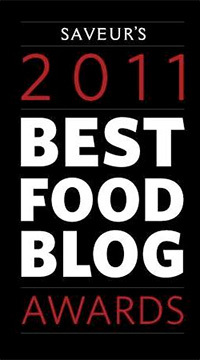 Winners for the Best Food Blog Awards are chosen by reader vote. You need to register to vote but signing-up is free, quick, and simple. Voting ends on May 12th and winners will be announced on May 17th. By the way, for those living outside the United States and Canada, choose Not Applicable for State, United States for Country when you sign up. Soak sotanghon noodles in about a quart of water until it softens, about 10 minutes. 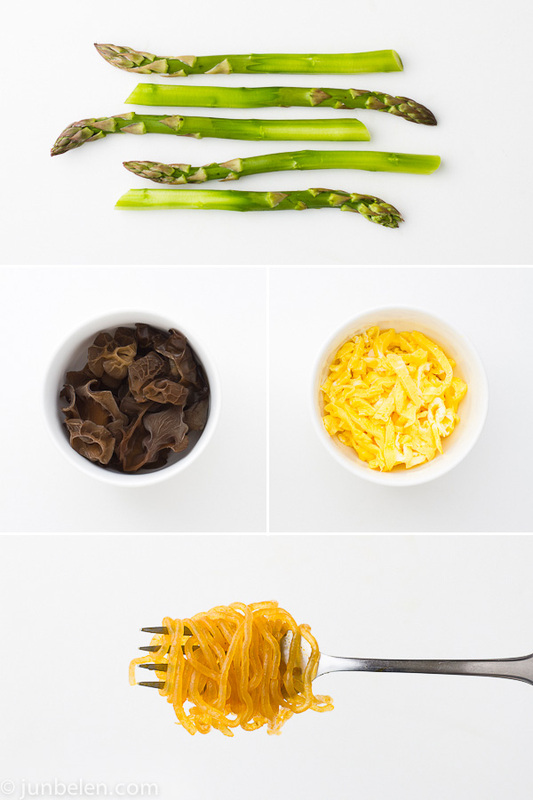 Cut noodles into 6-inch lengths. Heat oil in a large pan over medium-high heat. Saute garlic until lightly browned. Add onions and saute until fragrant and softened. Add carrots, asparagus, and mushroom and stir fry for a few minutes. Add chicken and stir fry until well combined. Transfer meat and vegetables to a bowl and set aside. Pour chicken stock into the pan and bring to a boil. Add mung bean noodles, soy sauce, and fish sauce. Turn the heat to medium and let the noodles simmer, stirring frequently until approximately 1/4 cup stock remains. Add the meat and vegetables back into the pan and stir fry everything together until all the stock has boiled off. Add salt and pepper to taste. Top with scrambled eggs and spring onions and serve with a squeeze of calamansi. 1. Wood ear mushrooms come fresh or dried. Soak dried mushrooms in water until they are reconstituted, about 10 to 15 minutes. Wood ear mushrooms are commonly called tenga ng daga in Filipino, which means rat ears because they are so shaped. 2. Use fresh vegetables that are in season. My mom makes sotanghon guisado with carrots, cabbages, and snow peas. Stir fry green beans, Brussel sprouts, or asparagus in pancit when they are in season. this just warms my heart! so, so proud of you. congratulations from this side of the continent. i shall get over my dislike for pancit guisado just to celebrate with you. ok, that might be a little lie. pancit canton might just appear instead. the world won’t know what hit it once they finally open up to Filipino cuisine. thank you for your amazing work in putting our food and culture on the map through your beautiful writing, pictures, and of course, cooking! i am dedicating Barbara Streisand and Judy Garland’s duet of ‘Get Happy and Happy Days’ for you!!! Congratulations Jun! i am in tears (tears of joy). I am sure your mom is so proud of you. What a great mother’s day gift. We also had similar celebrations for my son as he got his acceptance letters from the universities he applied to. And yes pancit was always added to the menu. May 1 was the deadline to commit and so last Saturday I cooked Pancit Sotanghon to celebrate his decision to go to Cornell. It will be too far from me but happy that my son is out there finding his own destiny. I’m sure your mom feels the same sentiments as I have. For some reason though Jun I thought you were a graduate of Stanford. Ask my husband, whenever I mention you, he says “aahh the guy from Stanford” haha because that’s the information I shared with him long before pa. Well call it foreshadowing? LOL! I only knew that I was wrong when I perused your info on FB. But I am so happy for you. We will be cheering for you as you embark onto your new journey. Go and get it JUN! Good luck and Godspeed. WOW! Cornell? That’s exciting, Malou!! Upstate New York may be a bit too cold but Cornell is an amazing university! I’m sure he’ll enjoy his stay there. Congratulations!! And just to clarify, the story about the acceptance letter was 13 years ago. You were right, I graduated from Stanford back in 2000. But thank you for the note, nonetheless. What can I say? I have no words to express how much I enjoyed your note this morning. I look forward to the day I finally meet you. Thank you so much for the message. Hello Jun and congratulations! I only discovered your blog recently and I’m loving it. Here’s to many future successes! Congratulations, Jun! I said it before, and I’ll say it again…the Saveur nomination and the acceptance letter are so well-deserved! In behalf of all your kababayan-food bloggers, we are proud of you. Thanks for generously sharing all these recipes. May you continue to be blessed with good fortune and much happiness! Mabuhay! Congratulations Jun in this momentous occasion! I am so happy for you and the work you’ve done in educating the filipino expatriates and the newbies to Filipino food. Thank you! Congratulations! I am a grandma who loves to cook, bake and eat especially for family and friends. Your blog is wonderful and deserving! It gets my vote! Even if this article talked about a past event, I am sure you still recall the warmth and happiness of receiving the Stanford acceptance letter. Our family is also looking at Stanford for our 13-year old granddaughter. God bless and thank you for your blog. Love it!!! Magda, thank you so much! Elizabeth, I can’t thank you enough! Apparently we were looking at each other’s blogs at the same time! I’m just loving that marble in your photos! Jun – so proud of you and happy that your blog was nominated. Love the story about the Stanford acceptance and the noodles look great. Momofuku would be proud as is your mother, I’m sure! Congratulations! Found you sa twitter. Talk about graduate school , my grand daughter has been accepted to Univ. of Notre Dame so i can relate to your mom’s pride at your acceptance to Stanford. What a coincidence bec. i was thinking of making sotanghon instead of bihon and wondering how to spike up the flavor of the noodles. Thanks for the recipe. I thoroughly enjoy your recipes and have tried a few of them already. Congratulations Jun! Even if we don’t know each other, it sill warms my heart to see that you got the nomination. I think you really deserve it because your blog is the epitome of perfection. I come back now & then to see what you have been cooking up. Even if my Filipino food cooking is so limited because of the scarcity of ingredients, I try to satisfy myself with what I have. Your site rekindles a lot of fond memories from my childhood because your pictures are really stupendous! Congrats, Jun!! A nomination well-deserved and I look forward to many more gorgeous posts with lovely stories. I’ll be voting for you! Weng, thank you for your thoughtful note. I’m glad that my blog is rekindling memories from long ago. It’s amazing how food binds us to those beautiful memories. Thank you for following the blog. Lana, thank you! You should be a very proud mom. UC Berkeley? Your daughter is very smart. Here’s wishing her continued success in school and in life. Again, thank you for your lovely note. Thank you so much Abigail for following. I owe you an ube chiffon cake recipe. Thank you so much for your thoughtful note. I’m rooting for your daughter. Stanford is an excellent school! Beth, thank you! And thank you for the marble board. I’m putting it in very good use! We use it in baking biscuits a lot lately but it’s been a lovely canvas for my photographs. Thank you! Dina, thank you so much! Your daughter has excellent taste! I’m rooting for her. Samantha, thank you! I will always remember that one afternoon we spent together at the Asian Culinary Forum, raising our eyebrows to you know who! Thank you! Thank you so much for trying the recipes out. Please let me know how it goes. I would love to hear from you. And congratulations and more power to your grand daughter. Congratulations Jun. A nomination and an acceptance within a week, your stars must be in alignment. Best of luck and of course we’ll be voting for you. Congrats Jun! I just voted! So proud of you! You truly deserve the nomination! Congrats Jun. Will vote for ya for sure. Good luck. As always loved the pics. Congrats on the Saveur nomination! That’s fantastic, so happy for you. Jun, a belated congrats on the Saveur nom! Well-deserved, to be sure! Congratulations, again! I voted as soon as Shulie informed me of the nomination though I’m obviously behind with my blog-reading/commenting! Congrats Jun for the nomination! We call thin soun which I used to at iit with drizzle spicy peanut sauce. Good luck on the Saveur nomination! I’ve voted for you today! congratulations for a very fine blog and the nomination! Thank you ever so much for sharing your wonderful experiences, your food, and yourself!